Backstage at UFC Philadelphia over the weekend, Michael Chiesa addressed the welterweight title picture, a possible fight with Neil Magny, and more. Philadelphia, PA — Despite what you may have heard and what he may have tweeted, Michael Chiesa does not have a fight booked with Neil Magny for Chicago’s UFC 238. 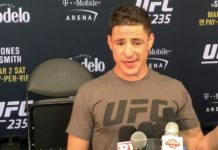 It might be in the works, “my manager’s in contact with his manager, and Sean [Shelby] liked the idea” he let slip back stage at UFC Philadelphia on Saturday. So no, a fight with Neil Magny is not a done deal for Michael Chiesa. He’s just looking for a way to break into the rankings. 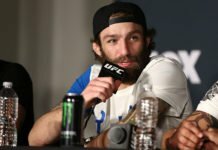 “I feel like beating a guy like Carlos Condit, I don’t want to sound entitled, but I do kind of feel like I should be entitled to fighting a guy in the bottom of the top fifteen,” Chiesa said. After all, that was quite a way to start his tenure in the UFC’s 170lb division. Watch the full UFC Philadelphia (UFC on ESPN 2) press scrum with Michael Chiesa above!